Plan your getaway with us! Redwood Retreat is a lodge-style new home nestled in the Ozark hills. We are located off the beaten path and yet close to all Branson has to offer. We have all the amenities you would come to expect from a high quality home, including a screened-in deck and patio. The 7-person hot tub on the back patio is a new feature and ready for you to enjoy! All six bedrooms include a king-size bed with a flat screen TV. The second floor living area also includes two sleeper sofas. Our vacation home also has as a fully equipped kitchen and gas grill with the grocery store just minutes away. All linens provided, as well as a washer and dryer. 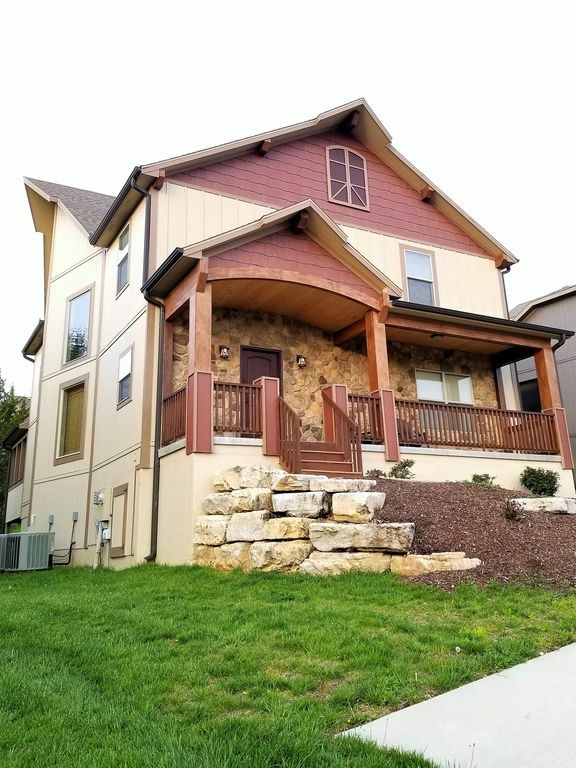 Our Branson Canyon location includes nature trails, a three-story clubhouse with pool and poker tables, as well as an outdoor zero-entry swimming pool and splash pad (opening May 12th). The public boat launch with courtesy dock is only a mile away. The State Park Marina is less than five miles away where you can rent all your boating craft needs while on vacation. Come relax and enjoy all Table Rock Lake has to offer! Table Rock Lake - courtesy dock located 1/4 mile from Branson Canyon. Loved staying here. King size beds are hard to find and this house has them! Very clean, plenty of parking and the screened in back porch and hot tub were enjoyed by all! We will definitely stay here again. Great girls weekend - we all loved it! Close to the Landing and Big Cedar Spa - enjoyed the hot tub every evening. We will be back! Great house! Perfect location if you are vacationing in Branson. House was perfect for our family of 10. It was clean and stocked with lots of kitchen pans, dishes, utensils, etc. Loved having tv's available in all the rooms. The downstairs den and the upstairs loft area were great places to gather!! Beautiful home. Close to the lake and close to Branson. We had 14 people and were very comfortable. Could have had 20 and still been completely comfortable. Very clean. Excellent family memories. Thank you so much for providing such an amazing space to stay. There were six of us who escaped reality for a Mom’s weekend away. We couldn’t have stayed anywhere nicer. Everyone had an amazing and relaxing weekend in this home. We’re already planning what weekend we want to come back. Perfect house for a relaxing vacation! The photos and descriptions were exact. We had no need of anything during our stay. Great location and so close to Branson. We would definitely return for another vacation. Thank you Kelly for making us feel so welcomed!